Japan (日本, Nihon or Nippon, officially日本国, Nihon-koku or Nippon-koku) is an island country that sits off the east coast of Asia. Japan comprises over three thousand islands, the largest of which are Honshū, Hokkaidō, Kyūshū, and Shikoku. Most of the islands are mountainous, and many are volcanic; Japan’s highest peak, Mount Fuji, is a volcano. The characters that make up Japan's name mean "sun-origin," which is why Japan is sometimes called the "Land of the Rising Sun." Japan's capital, Tokyo, and its surrounding prefectures make up the largest metropolitan area in the world, with over 30 million residents. Archaeological research indicates that people were living on the islands of Japan as early as 35,000 B.C.E. The first written records of Japan appear in Chinese history texts from the first century C.E. Ancient Japan had extensive cultural exchange with the neighboring countries of China and Korea. Japan's cultural development has been characterized by foreign influences, developed in a uniquely Japanese way. While sharing a similar Far Eastern culture based upon Confucianism and Buddhism with China and Korea, Japan actively adopted elements of Western culture after it abandoned its long-time policy of seclusion in 1854, due to the visit of Commodore Matthew Perry of the U.S. Navy. Japan's process of modernization utilized Western technology and methods of political and social organization. Japan can be regarded as the country that pioneered the path to economic growth and prosperity in Asia. During the period of European imperialism, the leaders of Japan carried out a concerted modernization effort, the Meiji Restoration, which made Japan into a world power that could contend with Europe and America. After World War II, Japan began manufacturing for export, gradually moving into the electronics, technology, and automobile industries. Since adopting the Constitution of Japan in 1947, Japan has maintained a unitary constitutional monarchy with an emperor and an elected parliament, the Diet. Japan is is a member of the United Nations, G8, and APEC, with the world's fifth largest defense budget. It is the world's fourth largest exporter and sixth largest importer. Japan is the second largest financial contributor to the United Nations, providing 20 percent of the UN budget (the U.S. contributes 25 percent). Japan as a nation, with its original tradition of "great harmony" (Yamato, its original name), is expected to continue to contribute to global peace-keeping efforts in social, cultural, and economic areas during the twenty-first century, because many in Japan wish to atone for the past militaristic expansionism that culminated in World War II. Mount Fuji, the highest point in Japan, with Lake Kawaguchiko and sakura blossoms in the foreground. Japan is comprised of over three thousand islands, stretching for about 1,500 miles (2,400 km), from northern Hokkaido in the northeast to the Ryukyu (Nansei) Islands (south of Kyushu) in the southwest, along the Pacific coast of the Asian continent. The island chain is separated from China to the southwest by the East China Sea; from South Korea, North Korea, and Russia, to the west and northwest, by the Sea of Japan; and from the Russian islands of Sakhalin and the Kurils to the north and northeast, respectively, by La Perouse (Soya) Strait, the Sea of Okhotsk, and Nemuro Strait. The Pacific Ocean constitutes the entire eastern coastal boundary. The main islands, from north to south, are Hokkaidō, Honshū, Shikoku, and Kyūshū. Together, these four islands account for 97 percent of Japan’s total land area of 145,883 square miles (377,835 square km). Honshu, Shikoku, and Kyushu enclose the Inland Sea. The Ryukyu Islands, including Okinawa, are a chain of islands south of Kyushū. Many smaller islands stretch in an arc between the Sea of Japan and the East China Sea and the Pacific proper. Together they are often known as the Japanese Archipelago. Most of the islands are mountainous, and many are volcanic; Japan’s highest peak, Mount Fuji, is a volcano. The general features of the four main islands are shapely mountains, sometimes snow capped, short rushing rivers; forested slopes; irregular and lovely lakes; and small, rich plains. Mountains, many of them volcanoes, cover two thirds of Japan's surface, hampering transportation and limiting agriculture. About 70 to 80 percent of the country is forested, mountainous, and unsuitable for agricultural, industrial, or residential use. This is due to the generally steep elevations, climate, and high risk of landslides caused by earthquakes, soft ground, and heavy rain. This has resulted in an extremely high population density on the arable land, which makes up only 11 percent of Japan's total land area, and is mainly located in coastal areas. The Japanese Archipelago was created by the subduction of the Pacific Plate (in the north) and the Philippine Plate (in the south) beneath the Eurasian Plate, upon which Japan lies. The tectonic movements of these plates have resulted in six mountain arcs off the northeastern coast of Asia: From northeast to southwest, the Chishima Range of the Kuril Islands; the Karafuto (Sakhalin) Mountain system of Hokkaido; the Northeast, Southwest, and Shichito-Mariana ranges of Japan; and the Ryukyu Island formations. Japan’s location on the Pacific Ring of Fire, at the juncture of three tectonic plates, makes it geologically unstable. The country experiences almost one thousand low-intensity tremors annually, and occasional volcanic activity. Destructive earthquakes, often resulting in tsunamis, occur several times each century. Major twentieth and twenty-first century earthquakes included the 2004 Chūetsu Earthquake, the Great Hanshin Earthquake (Kobe, 1995) and the Tokyo-Yokohama Earthquake (1923). At least sixty volcanoes have been active in Japan during recorded history. 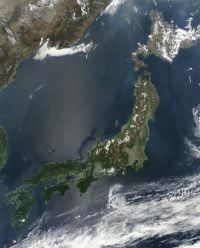 During the twentieth century, several new volcanoes emerged, including Showa Volcano on Hokkaido and Myojin Rock off the Beyoneisu (or Bayonnaise) Rocks in the Pacific. Since 1980, there have been major eruptions of Mounts O (1983) and Mihara (1986) in the Izu Islands and Mount Unzen (1991) in Kyushu. Many Japanese lakes, such as Lakes Kutcharo, Towada, and Ashi, are water-filled calderas. Hot springs are numerous throughout Japan and have been developed as resorts. Sea of Japan: On Honshū's west coast, the northwest wind in the wintertime brings heavy snowfall. In the summer, the region is cooler than the Pacific area, though it sometimes experiences extremely hot temperatures, due to the Föhn wind phenomenon. South-west Islands: The Ryukyu Islands have a subtropical climate, with warm winters and hot summers. Precipitation is very heavy, especially during the rainy season. Typhoons are common. The main rainy season begins in early May in Okinawa, and the stationary rain front responsible for this gradually works its way north until it dissipates in northern Japan, before reaching Hokkaidō in late July. In most of Honshū, the rainy season begins before the middle of June and lasts about six weeks. In late summer and early autumn, typhoons often bring heavy rain. Japan is home to nine forest ecoregions which reflect the climate and geography of the islands. They range from subtropical moist broadleaf forests in the Ryūkyū and Bonin islands, to temperate broadleaf and mixed forests in the mild climate regions of the main islands, to temperate coniferous forests in the cold, winter portions of the northern islands. The earliest human artifacts so far unearthed in Japan date to approximately 35,000 years B.C.E. People of those days probably derived from the region encompassing northern China, Tungpei, the southern Soviet Maritime, and the Korean peninsula. It is likely that they arrived in Japan by crossing a narrow strait between Kyushu from the continent, spreading northward to Hokkaido by 20,000 B.C.E. A middle Jōmon period vessel (3000 to 2000 B.C.E.). There is evidence that by 10,000 B.C.E., there existed a culture characterized by a Mesolithic to Neolithic semi-sedentary hunter-gatherer lifestyle of pit dwelling, augmented by a rudimentary form of agriculture. Decorated clay vessels from this period, called the Jomon (縄文, “cord marks”) period to describe the characteristic plaited patterns pressed into the clay, are some of the oldest surviving examples of pottery in the world (although this fact is contested because the date exists outside the known pottery-development time line for the rest of the world). In addition to developing the manufacture of pottery during the period of Jomon culture, the inhabitants of Japan progressed from chipped to polished stone tools. The Yayoi period (弥生時代), starting around the third century B.C.E., introduced new practices, such as wet-rice farming, iron and bronze-making, and a new style of pottery, brought by migrants from China or Korea. With the development of Yayoi culture, a predominantly agricultural society emerged in Japan. The Japanese first appear in written history as the people of Wō (Japanese pronunciation: Wa), in China’s Book of Han (漢書, 汉书), completed in 111 C.E. and covering the period of Chinese history from 206 B.C.E. to 25 C.E. The Book of Han mentioned that, “in the seas off Lo-lang (a Han colony on the Korean peninsula) lie the people of Wo, who are divided into more than 100 states, and who bring tribute at fixed intervals.” The Book of Later Han (後漢書, 后汉书, Hou Hanshu), composed in the fifth century by Fan Ye and covering the Eastern Han period from 25 C.E. to 220 C.E., relates that in 57 C.E. the “state of Nu in Wo” sent emissaries to the Later Han court, and received a gold seal from the emperor. A gold seal, apparently the same one awarded by the Chinese emperor, was unearthed on the island of Shikano, at the mouth of Hakata Bay, in 1748. According to the Book of Wei (魏志, Wei Zhi) in The Records of Three Kingdoms(三國志; 三国志; San Guo Zhi), an official historical text composed by Chen Shou in the third century, there was civil war in the state of Wo during the latter half of the second century, and Queen Himiko(卑弥呼, 175?–248? ), a female shaman and ruler of Yamataikoku, pacified the land and ruled over a confederation of more than thirty states that maintained a relationship with the Wei (魏) dynasty in China. The Wei Zhi gives a detailed description of the route from Lo-lang to the court of the Wo queen in “Yamatai,” and describes a society which had clearly-established social ranks, taxation, fairs at which people bartered goods, and buildings with raised floors. While conventionally assigned to the period 250–710, which includes the Kofun period (古墳時代, Kofun-jidai, c. 250-538) and the Asuka period (飛鳥時代, asuka jidai, 538-710), the actual start of Yamato ("great harmony") rule is disputed. The Yamato court, concentrated in the Asuka region, exercised power over clans in Kyūshū and Honshū, bestowing titles, some hereditary, on clan chieftains. The Yamato rulers dominated the clans and developed a central administration and an imperial court based on Chinese models. During the Yamato period (大和時代 Yamato-jidai), the Japanese imperial court moved its capital to Nara, then known as Yamato Province. Japan traded and maintained diplomatic relations with Korea and China, receiving waves of immigration and many cultural influences. Power was centralized, society became stratified and a government administration was set up resembling that of the Chinese T’ang dynasty. A written language developed using Chinese script. During the reign of Prince Shotoku in the early seventh century, a Seventeen-Article Constitution, the first written law in Japan, was adopted. Under the rule of Emperor Kōtoku (r. 645-654) the Taika Reforms established the imperial court as the supreme authority and created a feudal structure of land ownership and taxation. Mahāyāna Buddhism officially introduced to Japan in 538. According to Nihon Shoki, the second oldest historical text of classical Japan, Mahāyāna Buddhism (大乗仏教, Daijō Bukkyō) was officially introduced to the Yamato court through Baekje (百濟) in 552. Despite early resistance, Buddhism was promoted by the ruling class and became dominant by 600. Many Buddhist temples were built during the Yamato period. In 661, Yamato Japan allied with the Korean Baekje (百濟) restoration forces in attempt to repel an invasion by the forces of Silla (新羅) and the Tang Dynasty (唐朝) of China. Also known as Battle of Baekgang-gu or by the Japanese name Battle of Hakusukinoe (白村江の戦い Hakusuki-no-e no Tatakai or Hakusonkō no Tatakai), the battle took place in the lower reaches of the Geum River (錦江) in Jeollabuk-do ( 全羅北道) province, Korea. The Silla and Tang forces won a decisive victory, forcing Yamato Japan to withdraw completely from Korean affairs and crushing the Baekje restoration movement. As a result, a lot of cultured Baekje noblemen and intellectuals also came to Japan as exiles, making considerable contributions to the further development of literature, sculpture, architecture, and arts there. The Great Buddha at Tōdai-ji, Nara, cast in 752. The Nara period (奈良時代, Nara-jidai) of the eighth century marked the first emergence of a strong central Japanese state, centered around an imperial court in the city of Heijō-kyō (平城京), or modern day Nara. The Nara capital was modeled on the Chinese T’ang dynasty capital of Chang’an, and Chinese influence in Japan was stronger than at any other period. Buddhism dominated, and artisans produced refined Buddhist sculpture and built great Buddhist temples. 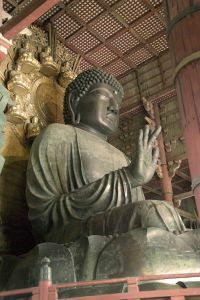 The statue of Great Buddha in Todai-ji Temple in Nara is understood to have been built under the leadership of a high government official whose grandfather was a well-known exile from Baekje. In addition to the continuing adoption of Chinese administrative practices, the Nara period is characterized by the appearance of a nascent written literature with the completion of the massive chronicles Kojiki (712) and Nihonshoki (720). Chinese characters were adapted for use in writing Japanese, and scholars studied Chinese literature. Copies were made of Chinese manuscripts, particularly Buddhist scriptures, and the first Japanese anthologies of poetry, the Kaifuso, a collection of Chinese poems by Japanese poets, and the Manyo-shu, an anthology of native poetry, were compiled. During the eighth century, the frontiers of the imperial state were extended to include southern Kyushu, and in the late eighth and early ninth century, a series of military campaigns conquered the Ezo (Emishi) people in northern Honshu. The Heian period (平安時代, Heian-jidai), began in 784, when Emperor Kammu (桓武天皇, Kanmu-tennō) moved the imperial capital to Nagaokakyō (長岡京) for a brief ten-year period, before relocating it to Heian-kyō (modern day Kyoto), where it remained for more than a millennium. During this period, the Japanese imperial court reached its peak. Chinese influence effectively ended with the last imperial mission to T’ang, China in 838, although trade expeditions and Buddhist pilgrimages to China continued. A distinctly indigenous Japanese culture emerged, noted for its art, poetry, and literature. Early in the eleventh century, Lady Murasaki (紫式部) wrote the world's oldest surviving novel, The Tale of Genji (源氏物語, Genji Monogatari). The lyrics of modern Japan's national anthem, Kimi ga Yo (君が代), were written during this time. Japan developed an indigenous writing system, kana, derived from Chinese script. The Chinese-style centralized government of the Nara period (710–784) gradually altered as the expansion of tax-exempt private estates (shoen) encroached upon the public domain. Political power in the imperial court was in the hands of powerful aristocratic families, especially the Fujiwaras, who dominated the court from the mid-ninth century, until 1027. In 1086, Emperor Shirakawa retired early in order to escape from court ritual and rule from behind the scenes, a tradition of “cloistered rule” (insei) continued sporadically by later emperors. Various military clans rose to power near the end of the Heian period. Towards the end of the twelfth century, conflicts between those clans turned into civil war (the Hōgen and Heiji Rebellions, followed by the Genpei war), from which emerged a society led by samurai clans, under the political rule of a shogun. Aristocrats continued to practice the elaborate and formal rites of Tendai and Shingon Buddhism, while the doctrines of the True Pure Land sect, emphasizing simple faith in Buddha Amida, grew in popularity among the common people. These doctrines offered solace to the populace during the social upheavals and armed struggles of the late Heian period. In 1185, following the defeat of the rival Taira clan (平氏), Minamoto no Yoritomo (源 頼朝) was appointed Shogun and established a base of power in Kamakura. Japan's feudal era was characterized by the emergence of the samurai, who superseded the ancient aristocracy as the ruling class. Overseas trade re-established contact with China, resulting in the introduction of Zen Buddhism, and of Neo-Confucianism from Sung China. The social upheavals that occurred at the end of the Heian period and during the early Kamakura period fostered a sense that the world was in crisis, and initiated a religious awakening. Several new Buddhist sects emerged that eschewed the esoteric teachings, complicated rites, and ascetic practices of traditional Buddhism. These included the Pure Land sect and its offshoot, the Shin (True) school, as well as the sect established by the former Tendai priest Nichiren. Zen Buddhism, which emphasized personal effort (jiriki) as the way to enlightenment, became popular with the samurai. The nobility in Kyoto continued to comment on ancient texts and to study precedents. In the early Kamakura period, however, a circle of waka poets emerged around the retired emperor Go-Toba, and produced a new imperial anthology, the Shin kokin wakashu. After Minamoto Yoritomo's death in 1199, the Hōjō clan (北条氏) began to rule as regents for the shoguns. In 1274 and again in 1281, the Mongols under Kublai Khan attempted to invade Japan. Aided by typhoons, interpreted by the Japanese as kamikaze, or Divine Winds, which destroyed the Mongol ships, the Kamakura shogunate succeeded in repulsing both invasions. Though the Japanese had been victorious, there were no spoils of war with which to reward the troops who had participated in the battles. This gave rise to economic hardship and discontent, and powerful local warlords began to challenge the authority of the Kamakura bakufu (government). The weaknesses of the Kamakura bakufu prompted a movement among the Kyoto aristocracy to reclaim political power from the military. A dispute over imperial succession which began in the mid-thirteenth century eventually resulted in the enthronement of Prince Takaharu as the Emperor Go-Daigo in 1318. The Kamakura shogunate was eventually overthrown by Emperor Go-Daigo (後醍醐天皇, Go-Daigo Tennō), who was defeated by Ashikaga Takauji (足利 尊氏) in 1336. The Muromachi period (1338–1573) is named for the Muromachi district in Kyoto, where Ashikaga Takauji, established his administrative headquarters. The third and most successful of the Ashikaga shoguns, Ashikaga Yoshimitsu (1358–1408), eliminated his rivals and resolved a long-standing division in the imperial line, creating an era of stability that lasted several decades. However, the succeeding Ashikaga shogunate failed to control the feudal warlords (daimyo), and a civil war erupted (the Ōnin War, 1467–77), followed by a century of military struggle known as “the age of the country at war” (sengoku jidai). In spite of the social and political disorder, important cultural developments took place during the Muromachi period under the influence of Zen Buddhism, such as the Japanese arts of tea ceremony, flower arranging, and noh drama. The Sung style of ink painting (sumie) reached its height. The Golden Pavilion (Kinkakuji) and Silver Pavilion (Ginkakuji) in Kyoto were constructed during the Muromachi period. The first European traders began to arrive in Japan in 1543, from Portugal, followed by Spaniards and Dutch (commonly known as "Kōmō," 紅毛, meaning "Red Hair"), and then by the British. The foreigners were called Nanban (南蛮, “Southern Barbarians”). The Portuguese first acted as trade intermediaries between Japan and China, which had prohibited direct trade with Japan because of the activities of Japanese pirates. Portuguese trade with Japan was progressively encroached upon by Chinese smugglers, official Japanese Red Seal Ships from around 1592, Spanish ships from Manila from around 1600, the Dutch from 1609, and the English from 1613. In 1638, the Tokugawa shogunate closed Japanese ports to all foreigners, permitting only the Dutch to remain, in the small enclave of Dejima. Japanese scholars and artisans began to study Western technology and culture. In 1549, the Roman Catholic missionary Francis Xavier arrived in Kagoshima on a Portuguese ship. He decided to evangelize Japan because in Malacca he met with a new Japanese Christian convert from whom he felt that "the Japanese might be the most inquiring minds of any of the lands he had visited thus far." When he returned to India late in 1551, he left two thousand Christians (kirishitan in Japanese those days), in five communities, to the care of his companions. Between 1574–1600, the daimyo Oda Nobunaga and his successor Toyotomi Hideyoshi, utilizing European firearms and technology, overcame numerous less powerful daimyo, and brought all the provinces of Japan under the control of the central government. This was a period of magnificence and ostentation, and temple architecture was replaced with the building of castles and mansions. The Azuchi-Momoyama period takes its name from two castles, Azuchi, built by Oda on the shore of Lake Biwa, and Momoyama, built by Hideyoshi in Kyoto. Castles were decorated with sliding panels and folding screens bearing beautiful large-scale paintings by masters of the Kano school. Hideyoshi, whose last major ambition was to conquer the Ming Dynasty of China, sent an army of 170,000 to invade Korea in April 1592, and occupied Seoul and Pyongyang, but was forced to retreat by Ming China forces in January of 1593. In 1597, he attempted a second invasion with an army of 140,000, but following Hideyoshi's death, Japanese troops were withdrawn in 1598. During the Azuchi-Momoyama period, Christian converts rapidly increased in number, perhaps because people were tired of a long period of warring states (Sengoku Jidai). A number of feudal warlords also accepted Christian faith. The first theological seminary was founded in Nagasaki in 1580. Oda Nobunaga allowed Christianity to spread partly because he wanted to use it against a rebellious Buddhist group called Ikko-shu and partly because he was aware of the merit of trade relations with Spain and Portugal. Toyotomi Hideyoshi initially permitted Christianity to exist, but eventually became suspicious. After Hideyoshi's death, Tokugawa Ieyasu utilized his position as regent for Hideyoshi's son, Toyotomi Hideyori, to gain political and military support. When open war broke out in 1600, he defeated rival clans in the Battle of Sekigahara. In 1603, he had himself appointed shōgun and established the Tokugawa shogunate at Edo (modern Tokyo). The Tokugawa shogunate enacted a variety of measures to control the daimyo, among them the sankin kōtai, a policy requiring every daimyo to reside in Tokyo every other year and to leave his immediate family in Tokyo as hostages. The social order was officially frozen, and mobility between the four classes of warriors, farmers, artisans, and merchants was prohibited. The resulting system of semi-autonomous domains under the central authority of the Tokugawa shogunate lasted for more than 250 years. Under the Tokugawa shogunate, Japan enjoyed internal peace, political stability, and economic growth. In 1639, the Tokugawa shogunate initiated the isolationist sakoku ("closed country") policy that spanned the two and a half centuries of the Edo period. The study of Western sciences, known as rangaku, continued during this period through contacts with the Dutch enclave at Dejima in Nagasaki. The Edo period also gave rise to kokugaku, or literally "national studies," the study of Japan by the Japanese themselves. Realizing that the work of Catholic missionaries had facilitated the colonial expansion of Spain and Portugal in Asia, the Tokugawa shogunate began to view Christian missionaries as a threat to their rule. The estimated number of Christian believers was 400,000 out of an estimated population of 12-15 million around the beginning of the Edo period. Although under Toyotomi Hideyoshi a celebrated execution of 26 Christians had already happened in 1597, the Tokugawa regime started its all-out crackdown and virtually wiped out Christianity except Kakure Kirishitan ("Hidden Christians"), who went underground. In the 1630s, a series of three decrees officially excluded foreigners from Japan and prohibited Japanese subjects from traveling or returning from overseas. Only a handful of Chinese and Dutch merchants were still permitted to trade through the southern port of Nagasaki. The only real exception from the policy of seclusion during the Edo period was Korea. This meant that Korea was the only nation Japan had a diplomatic relations with. To Japan, Korea sent a group of hundreds of delegates, called Tongshinsa (Tsushinshi in Japanese, "envoys of communication"), twelve times from 1607 to 1811. The first three times, peaceful talks were done and Korean captives taken from Toyotomi Hideyoshi's invasions to Korea in 1592 and 1597 were returned. This peaceful, diplomatic relation also enhanced cultural exchanges between the two countries. During the late eighteenth and nineteenth centuries, several ineffective attempts at fiscal reform by the government failed to relieve the financial burdens of the samurai class. In addition to financial problems and discontented samurai, the government had to deal with numerous peasant uprisings during the last three decades of the Tokugawa shogunate. On July 8, 1853, Commodore Matthew Perry and the "Black Ships" of the United States Navy arrived in Edo harbor with the intention of forcing the opening of Japan to foreign trade. When they returned on March 31, 1854, Japan signed the Convention of Kanagawa, and was soon forced to sign similar treaties with other Western nations such as Britain, Russia, and France. All these treaties were so-called "unequal treaties," which prohibited Japan from levying customs on foreign products and also allowed these Western nations to have their extraterritoriality. 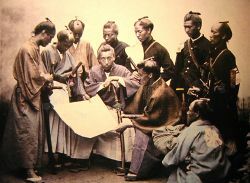 The threat of foreign encroachment, together with domestic unrest and instability, convinced many nobles and young samurai that direct imperial rule must be restored in order to unify and protect Japan. The powerful southwestern tozama domains of Choshu and Satsuma exerted pressure on the Tokugawa government. Forming an alliance with officials of the imperial court, they secured the cooperation of the young Emperor Meiji, who declared the abolition of the two-hundred-year-old Shogunate. Military movements by imperial forces and partisan violence in Edo led Tokugawa Yoshinobu, the sitting shogun, to launch a military campaign to seize the emperor's court at Kyoto. From 1868 to 1869, the Boshin War (戊辰戦争, Boshin Sensō, "War of the Year of the Dragon") was fought between forces of the ruling Tokugawa shogunate and those seeking to return political power to the imperial court. The military tide rapidly turned in favor of the smaller but relatively modernized imperial faction, and after a series of battles culminating in the surrender of Edo, Yoshinobu himself surrendered. The establishment of a government centered around the emperor led to significant changes in Japan's political and social structure. Known as the “Meiji Restoration” (明治維新), Meiji Ishin, Revolution, or Renewal, it occurred during a three-year period from 1866 to 1869. Several events have been designated as the end of the Meiji Restoration, including the Satsuma Rebellion (Seinan Sensō) in 1877, the opening of the Diet in 1885, or the official promulgation of the constitution in 1889. Western-style political, judicial, and military institutions, were introduced. In 1882, a parliamentary system modeled after the British parliament, was initiated with Ito Hirobumi as the first Prime Minister. Meiji era reforms transformed the Empire of Japan into an industrialized world power that embarked on a number of military conflicts to increase access to natural resources. Japan's ambition to get hold of Korea resulted in the Treaty of Ganghwa in 1876, which was an unequal treaty Japan ironically imposed on Korea—a treaty similar to the Convention of Kanagawa which was imposed by Commodore Perry in 1854. Also, a few other incidents that happened because of Japan's intention to end Korea's long status as a "tributary state" of China eventually led to the First Sino-Japanese War and China’s eventual recognition of Korea as an “independent state.” After victories in the First Sino-Japanese War (1894–1895) and the Russo-Japanese War (1904–1905), Japan gained control of Korea, Taiwan, and the southern half of Sakhalin. In 1910, Japan annexed Korea. Following the Russo-Japanese war, Japan maintained a military presence in Manchuria. Some historians argue that Japan did what powerful Western nations did during the age of imperialist colonialism. Japan and some Western nations even cooperated to accomplish their goals. Hence the Taft-Katsura Agreement of 1905, a secret diplomatic memorandum between the United States and Japan that mutually recognized Japan's sphere of influence in Korea and the United States's sphere of influence in the Philippines. Also, the second Anglo-Japanese Alliance of 1905 against Russia mutually acknowledged Japan's sovereignty over Korea and Britain's special privilege in India. Japan, however, eventually started having conflicts with Western nations, as she used the Manchurian Incident in 1931 to justify a complete invasion of Manchuria and the installation of Emperor Puyi, the last emperor of China, as a puppet ruler. Ignoring international protest and a mandate from the League of Nations, Japan remained in Manchuria until the end of World War II, developing an extensive industrial center there. The early twentieth century saw a brief period of "Taisho democracy" overshadowed by the rise of Japanese expansionism and militarization. World War I enabled Japan, which joined the side of the victorious Allies, to expand its influence and territorial holdings. The Showa (“bright peace”) period coincides with the reign of Emperor Hirohito, from 1926–1990. The first part of this period, from the emperor Hirohito's enthronement in 1926 to the end of World War II in 1945, is known as the early Showa period. The term “Showa literature,” denotes a distinct phase in Japanese literature from about 1924 until the outbreak of World War II in 1939, and the term “Showa Depression” refers to the Great Depression of the 1930s, which was particularly severe in Japan. Japan continued its expansionist policy by occupying Manchuria in 1931. As a result of international condemnation for this occupation, Japan resigned from the League of Nations two years later. In 1937, Japan invaded other parts of China, precipitating the Second Sino-Japanese War (1937–1945) and the placement of an oil embargo on Japan by the United States. Japan signed the Anti-Comintern Pact with Nazi Germany in 1936 and the Tripartite Pact in 1940, involving the three main Axis Powers of Germany, Italy, and Japan. Many of the naval leaders in Japan, such as Fleet Admiral Isoroku Yamamoto, were basically pro-American. They, and also the Emperor himself, were against the idea of signing the Tripartite Pact. Japan, however, ended up signing it for at least three reasons: First, because Japan realized the fact that the Unites States and the United Kingdom were supporting China against Japan's policy; second, because Japan was so impressed with the successful 1940 initial military advance Germany quickly made in Europe that she now wanted to work with Germany; and third, because Japan was so frustrated with the United States' oil export sanction that she wanted to find a new way to acquire oil from Indonesia, which was a colony of Holland, which had become occupied by Germany in the same year. On December 7, 1941, Japan attacked the United States naval base in Pearl Harbor and declared war on the United States, the United Kingdom, and the Netherlands. This act drew the United States into World War II. There were many political and military leaders in Japan who were against any war with the United States because they were aware of the military, economic, and political might of America. But, in October 1941, Army General Hideki Tojo, who represented the army's warlike position for its self-promotion, led the whole country to war. Fleet Admiral Yamamoto, who had to lead the Pearl Harbor attack, although he himself was against the war, expected to end the war quickly by arriving at a truce with the United States after the severe blow on Pearl Harbor. Japan continued to carry out its imperialist policies and proceeded to occupy many parts of Southeast Asia and many Pacific islands, as well as Korea and Manchuria. After the Soviet Union entered the war against Japan and atomic bombs were dropped on Hiroshima and Nagasaki in August 1945, Japan agreed to an unconditional surrender, on August 15 (V-J Day). The war cost Japan millions of lives and destroyed much of the country's industry and infrastructure. The United States put Japan under military governorship after its surrender. The International Military Tribunal for the Far East, was convened by the Allies on May 3, 1946, to prosecute Japanese leaders for war crimes, such as the Nanking Massacre. 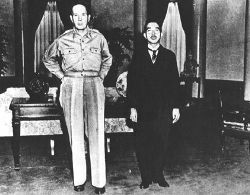 As for Emperor Hirohito, on September 27, 1945, just six weeks after the war ended, he personally visited and met with General Douglas MacArthur, Supreme Commander of the Allied Powers in Japan, telling the general that he himself was totally responsible for all the political and military decisions made during the war. For this and other reasons, MacArthur decided to exempt the emperor and all members of the imperial family from criminal prosecution. MacArthur has often been criticized of this decision. However, he likely regarded using the intact institution of the Emperor as the most practical way of rebuilding a peaceful Japan. What he did for Japan during the seven-year period of American occupation (1945-1952) is regarded by many as his greatest contribution to history. In 1947, under American occupation, Japan adopted a new pacifist constitution, emphasizing liberal democratic practices. After signing the San Francisco Peace Treaty with the Allied Powers in 1951, Japan once again became an officially independent nation in 1952, and was granted membership in the United Nations in 1956. Under a program of aggressive industrial development aided by the United States, Japan achieved spectacular economic growth, becoming the second largest economy in the world, with an annual growth rate averaging 10 percent for four decades. Although this ended in the mid-1990s when Japan suffered a major recession, positive growth in the early twenty-first century has signaled a gradual recovery. 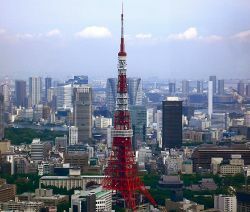 Japan can be regarded as the pioneer that showed other Asian countries the path toward economic growth and prosperity. Singapore, South Korea, China, India, and Taiwan have followed suit, and are now being followed by Thailand, Indonesia, Malaysia, and the Philippines. After World War II, the Japan Communist Party was officially allowed to be a legitimate party. As the Cold War began, Japan received strong ideological influence from the Soviet Union, People's Republic of China, and North Korea. Communist activities increased among workers, college students, and even intellectuals. However, most Japanese people always voted for anti-communist political leaders. In 1970, the WACL (World Anti-Communist League) had its annual convention in Tokyo. After the collapse of the Soviet Union and other communist countries, the power of communism rapidly decreased. When Japan surrendered in 1945, Korea was liberated from Japanese annexation. Until then, Japan had used all resources available from Korea, mobilizing many Koreans for military and labor purposes. 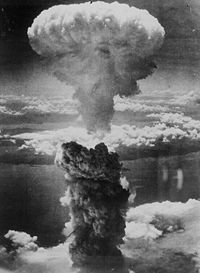 Among 2,300,000 Japanese soldiers who died during World War II, about 220,000 were Koreans; and among 300,000 citizens of Hiroshima exposed to the atomic bomb, about 30,000 were Koreans, and those who survived had to go through the pain of radioactive diseases. Furthermore, the Japanese economy quickly developed largely because of its assistance to the UN troops fighting in the Korean War (1950-1953). Also, many Japanese history textbooks apparently did not tell the full truth about Japan's prewar policy of expansionism, thus angering Koreans and Chinese. All this helped to worsen the already difficult relationship between Japan and Korea. Recently, however, both countries have begun growing closer in many ways, especially in the areas of culture and sports. For enhanced cultural exchanges, many Japanese now like to study the Korean language, and tourism between the two countries is booming. The Japanese now appreciate the deep emotional dimension of Korean movies such as Winter Sonata (겨울연가). The 2002 FIFA World Cup was held both in Japan and Korea, as the co-host countries. 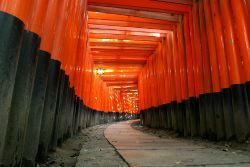 Despite the bursting of the Japanese asset price bubble in the early 1990s and subsequent slow economic growth, Japan remains a major economic and cultural power. Japan has diplomatic relations with nearly all independent nations and has been an active member of the United Nations since 1956. Japanese foreign policy has aimed to promote peace and prosperity for the Japanese people by working closely with the West and supporting the United Nations. During the Cold War, Japanese foreign policy was one-dimensional, focusing mainly on the economic realm. In recent years, however, both Japan's political elites and the public have shown a greater willingness to deal with security issues and support the Japan Self-Defense Forces. Japan's renewed focus on national security rests on an increasing sense of insecurity in the international environment, and its proximity to China and a belligerent North Korea. Nonetheless, there are still significant internal political and psychological constraints on, as well as intense Chinese and South and North Korean opposition to, strengthening Japan's defense and military capabilities. While maintaining its primary relationship with the United States, Japan has diversified and expanded its ties with other nations. Good relations with its neighbors continue to be of vital interest and most nations, except China and South Korea, view Japanese influence as mainly positive. After Japan signed a peace and friendship treaty with the People's Republic of China in 1978, ties between the two countries developed rapidly. The Japanese extend significant economic assistance to the China in various modernization projects. At the same time, Japan has maintained economic, but not diplomatic, relations with the Republic of China (Taiwan), where a strong bilateral trade relationship thrives. One major diplomatic and cultural initiative is the JET (Japanese Exchange and Teaching) Program, originally presented by former Prime Minister Yasuhiro Nakasone to Ronald Reagan as a "gift." University graduates from forty countries, mostly native speakers of English, work in Japan as Assistant Language Teachers (ALTs), Assistant Cultural Exchange Teachers (ACETs), and Sports Education Advisors (SEAs) in Japanese elementary, junior high, and high schools, or as Coordinators for International Relations (CIRs) in local governments and boards of education. The number of alumni who have participated in this program totals over 40,000. 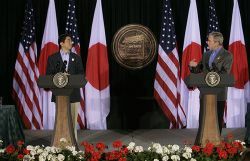 Japan maintains close economic and military relations with its key ally the United States, with the U.S.-Japan security alliance serving as the cornerstone of its foreign policy. As a member of the G8, the APEC, "ASEAN Plus Three," and a participant in the East Asia Summit, Japan actively participates in international affairs. Japan contributed non-combatant troops to the Iraq War. Japan is engaged in several territorial disputes with its neighbors: With Russia over the South Kuril Islands, with South Korea over the Liancourt Rocks, with China and Taiwan over the Senkaku Islands, and with China over the status of Okinotorishima. Japan also faces an ongoing dispute with North Korea over its abduction of Japanese citizens and its nuclear weapons and missile program. Japan's military is restricted by Article 9 of the Constitution of Japan, which renounces the right to declare war or use military force as a means of settling international disputes, although the current government is seeking to amend the Constitution via a referendum. 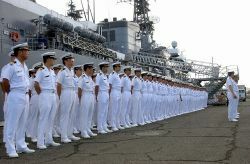 Japan's military is governed by the Ministry of Defense, and primarily consists of the Japan Ground Self-Defense Force (JGSDF), the Japan Maritime Self-Defense Force (JMSDF) and the Japan Air Self-Defense Force (JASDF). The forces have been recently used in peacekeeping operations and the deployment of Japanese troops to Iraq marked the first overseas use of its military since World War II. 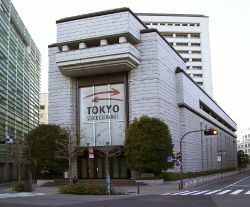 With a market capitalization of more than US$4 trillion, the Tokyo Stock Exchange is the second largest in the world. Close cooperation between government and industry, a strong work ethic, mastery of high technology, and a comparatively small defense allocation have helped Japan achieve one of the largest economies in the world. Banking, insurance, real estate, retailing, transportation, and telecommunications are all major industries. Japan has a large industrial capacity and is home to some of the largest and most technologically advanced producers of motor vehicles, electronic equipment, machine tools, steel, and nonferrous metals, ships, chemicals, textiles, and processed foods. It is home to leading multinational corporations and commercial brands in technology and machinery. Construction has long been one of Japan's largest industries, with the help of multi-billion dollar government contracts in the civil sector. Distinguishing characteristics of the Japanese economy have included the cooperation of manufacturers, suppliers, distributors, and banks in closely-knit groups called keiretsu(系列) and the guarantee of lifetime employment ( shūshin koyō 終身雇用) in big corporations. More recently, Japanese companies began to abandon some of these practices in an attempt to increase profitability. Japan is home to the world's largest bank, the Mitsubishi UFJ Financial Group, which has roughly U.S.$1.7 trillion in assets; the world's largest postal savings system; and the largest holder of personal savings, Japan Post, holding personal savings valued at around U.S.$3.3 trillion. It is home to the world's second largest stock exchange, the Tokyo Stock Exchange, with a market capitalization of over U.S.$4 trillion as of December 2006. It is also home to some of the largest financial services companies, business groups, and banks. 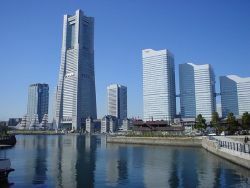 For instance, several large keiretsus (business groups) and multinational companies, such as Sony, Sumitomo, Mitsubishi, and Toyota own billion- and trillion-dollar operating banks, investment groups, and/or financial services, such as Sumitomo Bank, Fuji Bank, Mitsubishi Bank, Toyota Financial Services, and Sony Financial Holdings. From the 1960s to the 1980s, overall real economic growth has been called a "miracle:" a 10 percent average in the 1960s, a 5 percent average in the 1970s and a 4 percent average in the 1980s. Growth slowed markedly in the 1990s, largely due to the after-effects of over-investment during the late 1980s and domestic policies intended to wring speculative excesses from the stock and real estate markets. Government efforts to revive economic growth met with little success and were further hampered in 2000 to 2001 by the deceleration of the global economy. However, after 2005, the economy began to show strong signs of recovery. GDP growth for that year was 2.8 percent, with an annualized fourth quarter expansion of 5.5 percent, surpassing the growth rates of the United States and European Union during the same period. Because only about 15 percent of Japan's land is suitable for cultivation, a system of terrace farming is used to cultivate in small areas, resulting in one of the world's highest levels of crop yields per unit area. However, Japan's small agricultural sector is also highly subsidized and protected. Japan must import about 50 percent of its requirements of grain and fodder crops other than rice, and it relies on imports for most of its supply of meat. In fishing, Japan is ranked second in the world, behind China, in tonnage of fish caught. Japan maintains one of the world's largest fishing fleets and accounts for nearly 15 percent of the global catch. Japan relies on foreign countries for almost all of its oil. Transportation in Japan is highly developed. As of 2004, there were 1,177,278 km (731,683 miles) of paved roadways, 173 airports, and 23,577 km (14,653 miles) of railways. Air transport is mostly operated by All Nippon Airways (ANA) and Japan Airlines (JAL). Japan Railways is the largest rail operator. Extensive international flights link Japan to many cities and countries. Japan's main export partners are the United States (22.9 percent), China (13.4 percent), South Korea (7.8 percent), Taiwan (7.3 percent), and Hong Kong (6.1 percent). Japan's main exports are transport equipment, motor vehicles, electronics, electrical machinery, and chemicals. With very limited natural resources to sustain economic development, Japan depends on other nations for most of its raw materials; thus it imports a wide variety of goods. Its main import partners are China (21 percent), U.S. (12.7 percent), Saudi Arabia (5.5 percent), UAE (4.9 percent), Australia (4.7 percent), South Korea (4.7 percent), and Indonesia (4 percent). Japan's main imports are machinery and equipment, fossil fuels, foodstuffs (in particular beef), chemicals, textiles, and raw materials for its industries. Overall, Japan's largest trading partner is China. 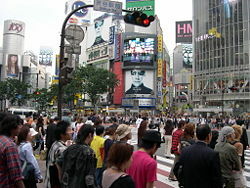 Japan is a leading nation in the fields of scientific research, technology, machinery, and medical research. Some of Japan's more important technological contributions are found in the fields of electronics, machinery, industrial robotics, optics, chemicals, semiconductors and metals. Japan leads the world in robotics, producing QRIO, ASIMO, and Aibo. Japan is also home to six of the world's fifteen largest automobile manufacturers and seven of the world's twenty largest semiconductor sales leaders. Japan has significant plans for space exploration, including the construction of a moonbase by 2030. The Japan Aerospace Exploration Agency (JAXA) conducts space and planetary research, aviation research, and development of rockets and satellites. It also built the Japanese Experiment Module for addition to the International Space Station. Primary, secondary schools, and universities were introduced into Japan in 1872 as a result of the Meiji Restoration. Since 1947, compulsory education in Japan consists of elementary school and middle school, which lasts for nine years (from age 6 to age 15). Almost all children continue their education at a three-year senior high school, and about 75 percent of high school graduates attend a university, junior college, trade school, or other post-secondary institution. Entrance to institutes of higher education is very competitive. According to The Times Higher Education Supplement, the two top-ranking universities in Japan are the University of Tokyo and Kyoto University. Healthcare services in Japan are provided by national and local governments. Payment for personal medical services is offered through a universal health care insurance system that provides relative equality of access, with fees set by a government committee. People without insurance through employers can participate in a national health insurance program administered by local governments. Since 1973, all elderly persons have been covered by government-sponsored insurance. Patients are free to select physicians or facilities of their choice. Japan is a constitutional monarchy (立憲君主制). The Emperor has very limited powers and serves mostly as a ceremonial figurehead, defined by the constitution as "the symbol of the state and of the unity of the people." Power is held chiefly by the Prime Minister of Japan and other elected members of the Diet(国会 kokkai), while sovereignty is vested in the Japanese people. The Emperor effectively acts as the head of state on diplomatic occasions. Emperor Akihito (明仁) is the current Emperor of Japan. Japan's legislative organ is the National Diet, a bicameral parliament( 議会), consisting of a House of Representatives (衆議院, Shūgiin), containing 480 seats elected by popular vote every four years or when dissolved; and a House of Councillors (参議院, Sangiin) of 242 seats, whose popularly-elected members serve six-year terms. There is universal suffrage (普通選挙 ) for adults over twenty years of age, with a secret ballot ( 無記名投票) for all elective offices. The liberal conservative Liberal Democratic Party (LDP, 自由民主党, Jiyū-Minshutō), has been in power since 1955, except for a short-lived coalition government（連立政権） formed from opposition parties in 1993. The Liberal Democratic Party was back in power by 1996. The relatively conservative LDP has supported the alliance with the United States and mutual security pacts between the two countries. The Social Democratic party (SDP, Social Democratic Party, 社会民主党, Shakai Minshu-tō, often abbreviated to 社民党, Shamin-tō; also formerly the Socialist party), which has opposed the security treaties with the United States, has long been the chief LDP rival; however, from 1994–99, the party formed a governing coalition with the LDP. Other significant parties currently include the largest opposition party, the social liberal Democratic Party of Japan (民主党, Minshutō), and New Komeito (公明党, Kōmeitō). The Prime Minister of Japan is the head of government. The position is appointed by the Emperor of Japan after being designated by the Diet from among its members, and must retain the confidence of the House of Representatives to remain in office. The Prime Minister is the head of the Cabinet (内閣, Naikaku)(the literal translation of his Japanese title is "Prime Minister of the Cabinet") and appoints and dismisses the Ministers of State, a majority of whom must be Diet members. Historically influenced by Chinese law, the Japanese legal system developed independently during the Edo period through texts such as Kujikata Osadamegaki(公事方御定書, Book of Rules for Public Officials). Since the late nineteenth century, the judicial system has been largely based on the civil law of Europe, notably France and Germany. In 1896, the Japanese government established a civil code based on the German model which, with post-World War II modifications, remains in effect in present-day Japan. 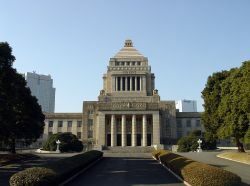 Statutory law originates in Japan's legislature, the National Diet of Japan, with the rubber-stamp approval of the Emperor. The current constitution requires that the Emperor promulgates legislation passed by the Diet, without specifically giving him the power to oppose the passing of the legislation. Japan's court system is divided into four basic tiers: The Supreme Court (最高裁判所, Saikō-Saibansho) and three levels of lower courts. The main body of Japanese statutory law is a collection called the Six Codes. The six codes are: 1) Civil Code (民法 Minpō, 1896); 2) Commercial Code (商法 Shōhō, 1899); 3) Criminal Code (刑法 Keihō, 1907); 4) Constitution of Japan (日本国憲法 Nippon-koku-kenpō, 1946); 5) Code of Criminal Procedure (刑事訴訟法 Keiji-soshō-hō, 1948); and 6) Code of Civil Procedure (民事訴訟法 Minji-soshō-hō, 1996). While there exist eight commonly defined regions of Japan, administratively Japan consists of forty-seven prefectures, each overseen by an elected governor, legislature, and administrative bureaucracy. The former city of Tokyo is further divided into twenty-three special wards, each with the same powers as cities. For the most part, Japanese society is linguistically and culturally homogeneous with only small populations of foreign workers, Zainichi Koreans, Japanese Chinese, Japanese Brazilians, and others. While Korea was colonized by Japan before and during World War II, hundreds of thousands of Koreans were brought to Japan to work as laborers; those who remained in Japan after the war, and their descendants, do not have Japanese citizenship and face considerable discrimination. Japan also has indigenous minority groups, such as the Ainu and Ryūkyūans, as well as social minority groups like the burakumin, who are often relegated to a second-class status. Although the indigenous Ainu were largely assimilated centuries ago, a few scattered groups around Hokkaido have maintained their identity. Before World War II, Okinawans were perceived as having a different culture and language from the rest of Japan; today they are recognized as sharing cultural traditions similar to the rest of the nation. Descendants of the burakumin, originally the lowest social class, responsible for performing undesirable tasks such as garbage collection and the slaughter of animals, still experience social discrimination and sometimes change their family names in order to achieve a higher social status. Japan has one of the highest life expectancy (平均余命) rates in the world, at 81.25 years of age, as of 2006. However, the Japanese population is rapidly aging, the effect of a post-war baby boom, followed by a decrease in births in the latter part of the twentieth century. In 2004, about 19.5 percent of the population was over the age of 65. The changes in the demographic structure have created a number of social issues, particularly a potential decline in the workforce population and increases in the cost of social security benefits, such as the public pension plan. It is also noted that Japanese youth are increasingly choosing not to marry or have families as adults. Japan's population is expected to drop to 100 million by 2050, and to 64 million by 2100. Demographers and government planners are currently in a heated debate over how to cope with this problem. Immigration and birth incentives have both been suggested as a means of providing younger workers to support the nation's aging population. Immigration, however, is not popular. Around 84 percent of Japanese people profess to adhere to both Shinto (the indigenous religion of Japan) and Buddhism. A minority (0.7 percent) of Japanese profess to Christianity, although Japan at one point in the beginning of the seventeenth century had a very large number of Christians (Kirishitan) thanks to the work of Catholic missionaries (approximately 400,000 Christians out of an estimated population of 12-15 million at that time). Throughout the Edo period, the Tokugawa regime severely persecuted this Catholic population, virtually wiping it out, except Kakure Kirishitan ("Hidden Christians"), who went underground. In 1865, a number of Kakure Kirishitan resurfaced after a 250-year interval and reunited with a Catholic priest from France. In the 1870s in the Meiji period, Protestant missionaries arrived in Japan. Buddhism, Taoism, and Confucianism came from China, and they have significantly influenced Japanese beliefs and mythology. The development of Shinto was radically altered by the influence of Buddhism, which was brought from China through Korea in the sixth century. Japanese schools of Buddhism also developed, such as Jodo, Shingon, and Nichiren. Confucianism also was part of the generally significant influence that Chinese culture wielded on the formation of Japanese civilization. Religion in Japan tends to be syncretic in nature, resulting in a variety of practices, such as parents and children celebrating Shinto rituals, couples holding weddings at Christian churches, funerals being held at Buddhist temples, students praying at Shinto shrines before exams, and many people trying to adhere to Confucianist ethics. Traditionally in Japan, new religious movements have developed during periods of political turmoil or social change. Since the end of the Edo period, numerous religious sects (Shinshūkyō) have emerged in Japan, mostly based on Shintoism or Buddhism. “New religions,” formed after World War II, have attracted many members. One of these, the Soka Gakkai, a Buddhist sect, grew rapidly in the 1950s and 60s and became a strong social and political force. More controversial is the Unification Church, which flourished in the latter part of the century despite weathering stiff opposition due in part to its Korean origins, opposition by some Japanese Christians, and questions about its fund-raising methods. About 99 percent of the population speaks Japanese as their first language. It is an agglutinative language, distinguished by a system of honorifics reflecting the hierarchical nature of Japanese society, with verb forms and particular vocabulary which indicate the relative status of speaker and listener. The Japanese language is generally considered to be part of the Altaic linguistic group and is related to Korean, though the vocabularies differ. Some linguists believe that Japanese also includes elements of Southeast Asian languages. Japanese has borrowed or derived large amounts of vocabulary from Chinese, and since the eighteenth century, thousands of Western loanwords, principally from English, have been adopted. The writing system uses kanji (Chinese characters) and two sets of kana (syllabaries based on simplified Chinese characters), as well as the Roman alphabet and Arabic numerals. Until the fourth century, there was no written form of the Japanese language. Chinese characters (kanji) were used to write Japanese and were gradually adapted into kana (katakana and hiragana), which could be used to write phonetically. Today some 3,000 to 5,000 kanji are in general use; after World War II, about 2,000 characters were officially identified as necessary for a basic vocabulary and the writing of these characters was simplified. The Ryūkyūan languages, also part of the Japonic language family to which Japanese belongs, are spoken in Okinawa, but few children learn these languages. The Ainu language is moribund, with only a handful of elderly native speakers remaining in Hokkaidō. Most public and private schools require students to take courses in both Japanese and English. Historically, the development of Japanese culture has been characterized by periods of foreign influence followed by periods of isolation, during which the foreign innovations were developed into uniquely Japanese cultural traditions. Traditional Japanese arts include crafts (ikebana, origami, ukiyo-e, dolls, lacquerware, pottery), performances (bunraku, dance, kabuki, noh, rakugo), traditions (games, tea ceremony, budō, architecture, gardens, swords), and cuisine. Urbanization and the rise of a middle class during the Edo period created a demand for popular art and music and resulted in artistic innovations such as ukiyo-e, souvenir woodblock prints, and posters. Western influence introduced new concepts to Japanese artists and craftsmen, whose work in turn influenced European art during the nineteenth century. The fusion of traditional woodblock printing and Western art led to the creation of modern manga, a typical Japanese comic book format that is now popular within and outside Japan. Manga-influenced animation for television and film is called anime. Japanese-made video game consoles have prospered since the 1980s. Japanese music is eclectic, having borrowed instruments, scales, and styles from neighboring cultures. Many instruments, such as the koto, were introduced in the ninth and tenth centuries. The accompanied recitative of the Noh drama dates from the fourteenth century and the popular folk music, with the guitar-like shamisen, from the sixteenth. Western music, introduced in the late nineteenth century, now forms an integral part of Japanese culture. Post-war Japan has been heavily influenced by American and European modern music, which has led to the evolution of popular band music called J-Pop. Karaoke is the most widely practiced cultural activity. A November 1993 survey by the Cultural Affairs Agency found that more Japanese had sung karaoke that year than had participated in traditional cultural pursuits such as flower arranging or tea ceremony. The earliest works of Japanese literature include two history books, the Kojiki (Records of Ancient Matters) and the Nihon Shoki (Chronicles of Japan) and the eighth century poetry book Man'yōshū (Collection of Ten Thousand Leaves), all written in Chinese characters. The Tale of the Bamboo Cutter is considered the oldest Japanese narrative. The Pillow Book written by Sei Shōnagon gives a detailed account of Heian court life, and its contemporary, The Tale of Genji by Lady Murasaki is often described as the world's first novel. During the Edo Period, literature was no longer confined to the elite aristocratic and samurai classes. Literary genres such as the yomihon used legend, romance, and fantasy as subject matter, rather than history and the lives of the nobility. During the Meiji era, traditional literary forms declined as Japanese literature integrated Western influences. Natsume Sōseki and Mori Ogai were the first "modern" novelists of Japan, followed by Akutagawa Ryūnosuke, Tanizaki Junichirō, Kawabata Yasunari, Mishima Yukio and, more recently, Murakami Haruki. Japan has two Nobel Prize-winning authors, Kawabata Yasunari (1968) and Oe Kenzaburo (1994). Sumo, a traditional Japanese sport. 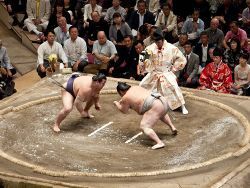 Sumo, traditionally Japan's national sport, is one of its most popular spectator sports. Martial arts such as judo, karate, and kendō are also widely practiced and enjoyed as spectator sports in Japan. After the Meiji Restoration, many Western sports were introduced and began to spread through the education system. The professional Japanese Baseball League was established in 1936. Today baseball is the most popular spectator sport in the country. One of the most famous Japanese baseball players is Ichiro Suzuki, who, having won Japan's Most Valuable Player award in 1994, 1995, and 1996, now plays in North American major league baseball. Since the establishment of the Japan Professional Football League in 1992, football in Japan has also gained a wide following. 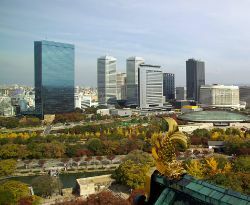 Japan was a venue of the Intercontinental Cup from 1981 to 2004, and co-hosted the 2002 FIFA World Cup with South Korea. Golf is popular in Japan, as is auto racing, the Super GT sports car series, and Formula Nippon formula racing. Japan quickly became an industrialized nation with modern military power in the nineteenth century, and was able to avoid being colonized by Western powers. But it adopted a policy of militaristic expansionism to occupy and control many foreign lands and territories in Asia, and this continued until it lost World War II. Some argue that Japan simply imitated Western imperialism as a normal course, and that Western powers even instigated Japan to go to war in this context. Others attribute Japanese military expansionism to one particular weakness of the Meiji Constitution of 1889: the constitutional independence of the military command from the government. But, as many have expressed, the image of Japan as a nation undoubtedly has been tarnished by its past aggression. Given this, many believe that Japan must and can contribute its visible and invisible resources positively for the sake of the world. Japan has considerable economic resources, and is the second-largest financial contributor to the United Nations. Many service project organizations such as Japan Overseas Cooperation Volunteers (JOCV) have been created. For the Japanese, "Harmony is the most precious value," according to the first article of the Seventeen-Article Constitution by Prince Shotoku around 700 C.E. As the only country that was struck by nuclear weapons in history, Japan is showing its desire to play a role for peace and harmony in the world, by reconciling with Korea and by appreciating the help of the Uinted States after World War II. ↑ 法制執務コラム集「法律と国語・日本語」 (in Japanese). Legislative Bureau of the House of Councillors. Retrieved July 27, 2018. ↑ CIA, Japan World Factbook. Retrieved July 27, 2018. ↑ 最新結果一覧　政府統計の総合窓口　GL08020101. Statistics Bureau of Japan. Retrieved July 27, 2018. ↑ 5.0 5.1 5.2 5.3 World Economic Outlook Database, April 2018 – Report for Selected Countries and Subjects. International Monetary Fund (IMF) (April 2018). Retrieved July 27, 2018. ↑ World Factbook: Gini Index. Central Intelligence Agency. Retrieved July 27, 2018. ↑ JNTO, Japan's Famous Hot Springs Retrieved July 27, 2018. ↑ JNTO, Essential Info: Climate. Retrieved July 27, 2018. ↑ Charles T. Keally, A Model for the Origins of the Japanese Paleolithic. Retrieved July 27, 2018. ↑ Delmer M. Brown (ed. ), The Cambridge History of Japan (Cambridge University Press, 1993), 140–149. ↑ William Gerald Beasley, The Japanese Experience: A Short History of Japan (University of California Press, 1999). ↑ 12.0 12.1 12.2 Conrad Totman, A History of Japan (Blackwell, 2002). ↑ Metropolitan Museum of Art, Heian Period. Retrieved July 27, 2018. ↑ George Sansom, A History of Japan: 1334-1615 (Stanford, 1961). ↑ Hose Colaco, "St. Francisco Xavier: his life and times." Retrieved July 27, 2018. ↑ Stephen Turnbull, Samurai Invasion: Japan's Korean War (Cassel, 2002). ↑ Roland H. Worth, Jr. No Choice But War: The United States Embargo Against Japan and the Eruption of War in the Pacific (McFarland, 1995, ISBN 0786401419). ↑ Kelley L. Ross, The Pearl Harbor Strike Force. Retrieved July 27, 2018. ↑ Educationworld.net, Japanese Instrument of Surrender. Retrieved July 27, 2018. ↑ BBC News Online, Japan scraps zero interest rates. Retrieved July 27, 2018. ↑ The BBC, World Service Poll. Retrieved July 27, 2018. ↑ Michael Green, Japan Is Back: Why Tokyo's New Assertiveness Is Good for Washington. Retrieved July 27, 2018. ↑ BBC News, Japan approves constitution steps. Retrieved July 27, 2018. ↑ The Economist, Japan's Economy: Free at last. Retrieved July 27, 2018. ↑ MoneyWeek, Why Germany's economy will outshine Japan. Retrieved July 27, 2018. ↑ Washington Post, Japan Merger Creates World's Largest Bank. Retrieved July 27, 2018. ↑ Country-data.com, Japan: Patterns of Development. Retrieved July 27, 2018. ↑ CIA Factbook, Japan Retrieved July 27, 2018. ↑ Hisane Masake, A farewell to zero. Retrieved July 27, 2018. ↑ Kingshuk Roy, Water Resources in relation to Major Agro-Environmental Issues in Japan. Retrieved July 27, 2018. ↑ Paul Blustein, "China Passes U.S. In Trade With Japan: 2004 Figures Show Asian Giant's Muscle." Retrieved July 27, 2018. ↑ Moon Daily, Japan Plans Moon Base by 2030. Retrieved July 27, 2018. ↑ Japan Aerospace Exploration Agency, Japan Aerospace Exploration Agency Retrieved July 27, 2018. ↑ Victor Rodwin, Health Care in Japan. Retrieved July 27, 2018. ↑ National Institute of Population and Social Security Research, Health Insurance: General Characteristics. Retrieved July 27, 2018. ↑ Office of the Prime Minister of Japan, The Japanese Judicial System. Retrieved July 27, 2018. ↑ Masaru Mabuchi, Municipal Amalgamation in Japan. Retrieved July 27, 2018. ↑ Naohiro Ogawa, Demographic Trends and Their Implications for Japan's Future. Retrieved July 27, 2018. ↑ Howard French, Insular Japan Needs, but Resists, Immigration. Retrieved July 27, 2018. ↑ Lucien Ellington, Japan Digest: Japanese Education. Retrieved July 27, 2018. ↑ The Guardian, J-Pop's dream factory Retrieved July 27, 2018. ↑ Bill Kelly, "Japan's Empty Orchestras: Echoes of Japanese culture in the performance of karaoke," The Worlds of Japanese Popular Culture: Gender, Shifting Boundaries and Global Cultures, 1998, 76. ↑ PBS, Sumo: East and West. Retrieved July 27, 2018. ↑ Embassy of Japan in the UK, Culture and Daily Life. Retrieved July 27, 2018. ↑ Yoichi Nagata and John B. Holway, Total Baseball,4th ed. (New York: Viking Press, 1995). ↑ The Japan Forum, Soccer as a Popular Sport: Putting Down Roots in Japan. Retrieved July 27, 2018. ↑ For example, Hamilton Fish, Tragic Deception: FDR and America's Involvement in World War II (Devin-Adair, 1984). ↑ Kazutishi Hando et al., Why Did We Lose That War? (Ano Sensou ni Naze Maketanoka) (Tokyo: Bungei Shunju, 2006). Beasley, William Gerald. The Japanese Experience: A Short History of Japan. University of California Press, 1999. Fish, Hamilton. Tragic Deception: FDR and America's Involvement in World War II. Devin-Adair, 1984. Hando, Kazutishi, et al., Why Did We Lose That War? (Ano Sensou ni Naze Maketanoka) Tokyo: Bungei Shunju, 2006. Nagata, Yoichi, and John B. Holway. Total Baseball. New York: Viking Press, 1995. Sansom, George. A History of Japan: 1334-1615. Stanford, 1961. Totman, Conrad. A History of Japan. Blackwell, 2002. Turnbull, Stephen. Samurai Invasion: Japan's Korean War. Cassel, 2002. Kantei.go.jp—Official Prime Minister and cabinet site. Shugi-in.go.jp—Official site of the House of Representatives.